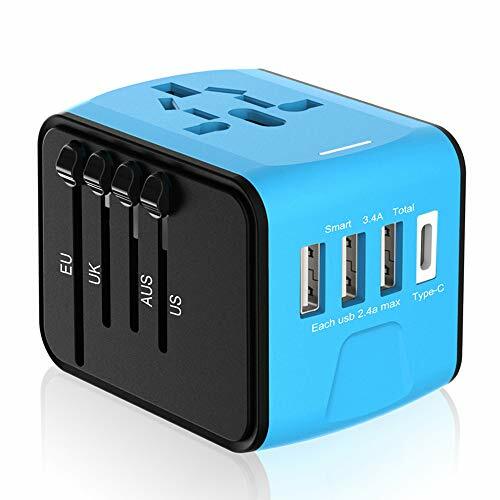 Travel Adapter works in Over 160 Countries Worldwide - EU / US / UK / AU Plugs .The travel adapter covers over the United States, Britain, Europe, Australia, China, Japan, Korea, India, Italy, Brazil, Asia, the Middle Eastetc. The travel adapter is small and portable, the International Travel Power Adapter is your best partner whenever and wherever you need it. Only one plug-type can be used at one time, other plug-pins are locked automatically. To avoid possible damage to your equipment or other safety hazards, make sure that the electrical outlet you are using has the proper voltage to operate the equipment before using this adapter. We have quality GrowGlow after-sales service team, if you have any questions, you can contact us at any time, friendly support team provide you with efficient solutions. I hope our travel adapter will make you feel happy on your travels.